We met Buddy at the Museum of Northern Arizona’s 70th Annual Hopi Marketplace, a summer celebration of Hopi art and creativity. The Hopi live primarily on three mesas in Northern Arizona, and have maintained their religious and cultural beliefs more consistently than any other American Indian people. In recent years, they have been willing to share appropriate elements of their culture with outsiders, the most visible element of this sharing expressed in Kachina dolls carved from cottonwood roots, and paintings rich in Hopi imagery and symbolism. Buddy’s Kachina carvings and paintings seemed to us to represent landmarks in creativity, and we invited him to paint a Pony. Buddy works in the “old” style of carving, painting and adornment, drawing on a rich heritage of decorations and shapes, some dating back more than 400 years. At the same time he is one of the new generation of carvers who moves away from traditional styles by adding movement and intricate details through the creative use of electric tools. Deeply rooted in Hopi culture and tradition, he has developed a style and a flair that is uniquely his own. Buddy’s distinctive carvings vary from Hopi dolls to larger carvings of other Hopi symbols: bears, birds, eagles and hawks – each with a special story and significance. His paintings – done in both acrylic and oil – are powerful, individual interpretations of Hopi ceremonies mixed with personal memories of growing up in one of the most stark and striking areas of the Southwest. 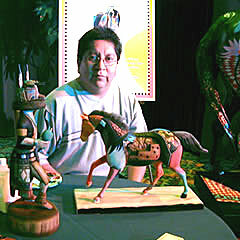 His work is sold mostly through Indian Artisan Shows, but it has also been displayed at galleries and museums, and is now available at The Trail of Painted Ponies. Jeff Lane, my art teacher in high school. I was a wild teenager who had taken to a beverage that was controlling me, and I guess he saw something in me because he showed a special interest. He made me his art assistant. He gave me special projects. He kept me in school, and a lot of who I am today is because of him. Wasted Days and Wasted Nights, by Freddie Fender. Mom would play that every morning, and hearing in over and over, it grew on me. Red. It’s bright and attention-getting. I use it when I want something to come forward and grab the eye. My grandfather. He was an old war chief, the head of special society. He used to take me with him on the back of a donkey when he herded sheep and planted corn. I would lock my thumbs in the belt loops of his pants so I wouldn't fall off. He would tell me stories and talk to me hour after hour. It was a very special education. Don’t take life too seriously. Learn to laugh at yourself.